I have a great friend called Ötkür who is from Uyghur. Uyghur is a Turkish province in China and once it was ruled by Russia, so this guy is not only fluent in Turkish and Uyghur but also Chinese, Russian and English. I was lucky enough to travel with him up to Georgia and although I speak a few other languages, we would never have got by without him. His cuisine is Turkish with a strong Chinese influence of the spicy kind. He eats hot Asian type meals and they are quite wonderful. 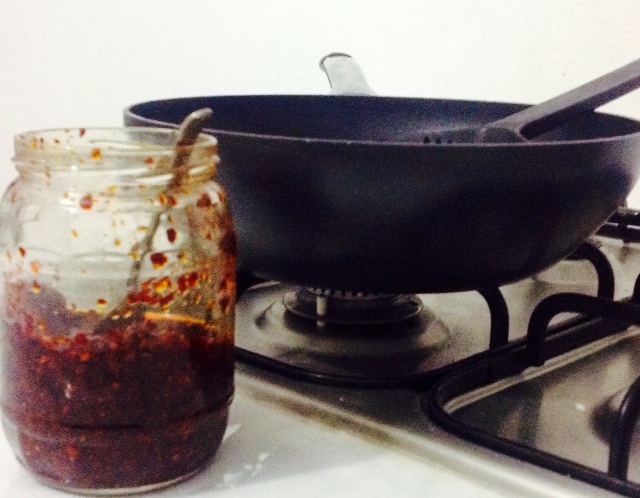 His vital ingredient is a jar of Chilli Oil that sits on the counter beside his stove top. There is a spoon in the jar which is never put anywhere else and this jar with its aromatic contents is totally indispensable to his cooking. I was lucky enough for him to share the recipe with me and I have found it a Godsend. It’s used so often whenever I want to add a bit of heat or a garlic flavour to my cooking. I hope you enjoy this chilli oil as much as I do. The flavour of this chilli oil is by no means specific to Asian cuisine. We have used it when cooking eggs for breakfast along with many other dishes , including börek, roasted vegetables and spicing up bean dishes etc. As long as it stays close to my hob, I will often be diving in the jar and it certainly perks up whatever is cooking. By the way, this recipe for chilli oil ensures that it can easily last a year without going off. The secret is that no moisture whatsoever must get into the jar. The spoon must never get wet or touch anything but the chilli oil. Either leave a spoon in the jar at all times or take a fresh spoon each time. If it touches your food, take a clean spoon if you need more chilli oil. You need a tall glass jar for this which will take minimum 1 litre. When you want to use this oil, stir the spoon in the jar and take out lumps of pepper with the oil. Heat up oil in another pan until almost smoking. Stand over it, do not leave it whilst heating. Wait 20 seconds after turning off the heat before pouring oil over the other ingredients. Stir very well, quite quickly so that the pepper cannot burn. This jar is best kept close to the stove, to remind you to use this wonderful condiment. Never use a wet spoon or let any moisture get into the jar. If you enjoy some spice in your life, hopefully this chilli oil recipe will bring much delight to your meals!